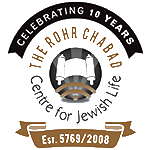 Launched in December 2008, Chabad is your address for everything Jewish. From university students to retirees, young professionals to moms, dads and kids, there is something for everyone here. Join us for our exciting holiday programs, an enriching class, or a reinvigorating Shabbat meal. We are here to serve you, and with so many opportunities available just around the corner, all you need to do is show up. Join our weekly email list to be kept abreast of all that's happening. Our website is part of the award winning Chabad.org network. You can confidentially Ask the Rabbi any question that you may have, check our Calendar to stay updated on upcoming events, browse and download from our extensive Audio or Video sections, dig through our Knowledge Base for an informative article, and so much more. We welcome your feedback and comments. Click here to contact us.